The awards are given to those who embody volunteerism and leadership at the district’s school. Special to The Sun: Student volunteers honored were, from left, Meghan Vizzard, Gianna Glatz, Avi Patel and Ian Zink, accepting for his brother Cole Zink. 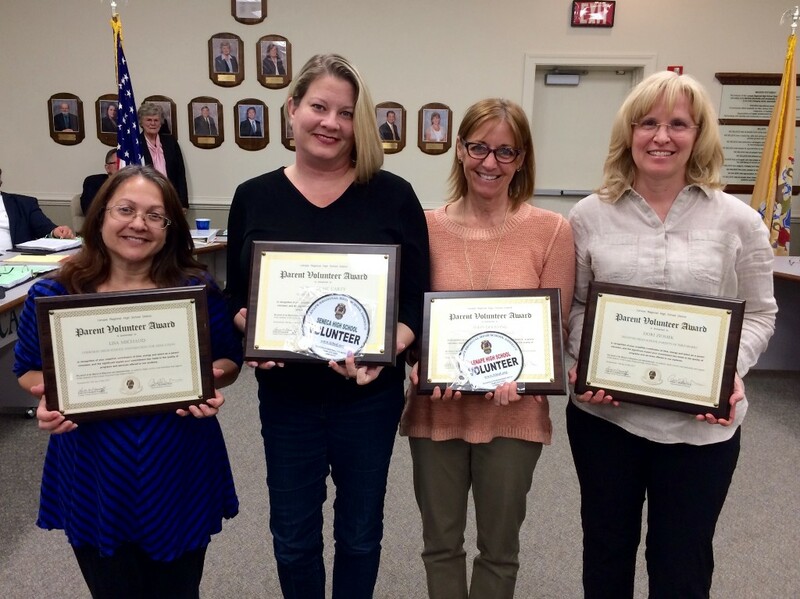 Volunteerism was the theme of the night at last night’s Lenape Regional High School District Board of Education meeting, as the board honored the recipients of this year’s volunteer service awards. Each year around the time of its May meeting, the board honors student and parent volunteers from each of the district’s four high schools who spend their time during the school year giving back to others and working to improve their school communities. This year’s student award winners included Cherokee High School senior Avi Patel, Lenape High School junior Meghan Vizzard, Seneca High School senior Cole Zink and Shawnee High School senior Gianna Glatz. During the meeting, the board played a video package in which teachers and students spoke about their service, and afterward principals from each high school spoke on behalf of their hard work. Patel was honored for his more than 500 hours tutoring elementary and middle school students at the Kumon Learning Center, in addition to his work as president of the Community Service Club at Cherokee and his work as a member of the LEO Club and Renaissance. Vizzard was honored for her work as founder of Cozies 4 Chemo, which crafts fleece blankets for those suffering from cancer throughout the nation. Although Vizzard started the charity in 2012 as a way to help her 19-year-old cousin who was undergoing treatment for ovarian cancer, since that time the nonprofit has provided blankets to thousands more. Vizzard is also a member of National Honor Society and Community Service Club. Zink was honored for his dedication as a member of the Willingboro Fire Department and Hampton Lakes Fire Company in Southampton, in addition to his more than 200 hours of volunteering as a camp counselor for children of deployed soldiers and his service with special needs students in the Buddies Club at Seneca. Glatz was honored for her work with the Give Kids the World Village resort for children with life-threatening illnesses, the Special Olympics and Habitat for Humanity in Baltimore. At Shawnee, Glatz is vice president of the Kids Wish for Kids Club and is a peer tutor. Parent volunteers honored were, from left, Lisa Michaud, Michelle McCarty, Lisa Doulong accepting for her husband John Doulong and Dori Ziomek. Also honored at the meeting were Cherokee parent Lisa Michaud, who has led the Cherokee Foundation for Education since 2011; Lenape parent John Doulong for his work assisting Lenape’s football and baseball programs; Seneca parent Michelle McCarty, who works to enrich the Seneca’s marching band; and Shawnee parent Dori Ziomek, who has worked to help the operation of the school’s musical productions.